APPEARANCES: Sam is available to address groups, organizations, synagogues and other audiences with his riveting recollections.. He can be booked–there is no cost–through his press representative Judy Katz at 212-580-8833, jkatzcreative@gmail.com. We will be delighted to schedule his talk, and send you a list of questions to which Sam will respond when he appears at your event. MEDIA REQUESTS: For a press release, copy of the obok, and to set up an interview with Sam, media interviews please contact Judy Katz at Katz Creative, Inc. 212-580-8833, jkatzcreative@gmail.com. Holocaust survivor Sam Solasz of Boca Raton was considered the teenage angel of the Bialystok, Poland ghetto during World War II. Solasz, 90, recently wrote a memoir called “Angel of the Ghetto: One Man’s Triumph Over Heartbreaking Tragedy” with co-author Judy Katz. He also recently took a 10-day trip to Poland where, on the 75th anniversary of the Bialystok Ghetto Uprising, Solasz was honored for his brave acts fighting with the other starving, under-armed Jews who revolted against 2,000 heavily armed Nazis and held them off for 3 days. Solasz was only 15 at the time and alone in the world. His parents and nine of his 11 siblings had already been killed in the Treblinka Concentration Camp, while his two older sisters were killed at Babi Yar. 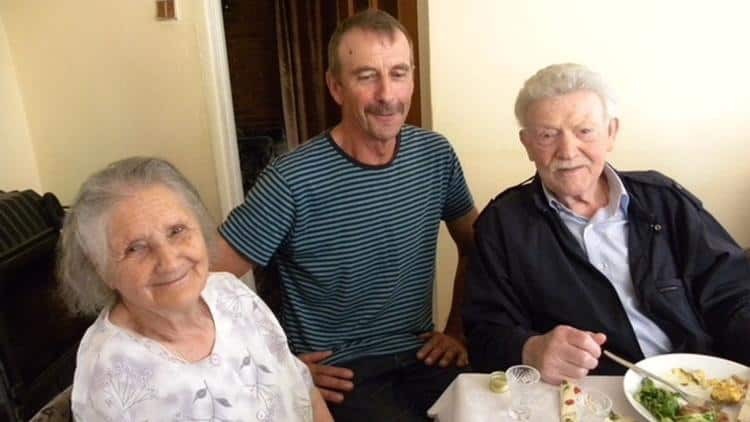 Solasz brought his family and close friends with him to Poland as they revisited his painful past while touring concentration camps, burial grounds, his hometown, his mother and grandmother’s birthplace and the farmhouse where he hid his Jewish identity for 18 months. “I was very happy to see the grandchildren of the people of the farmhouse who I lived with for 11 months,” Solasz said. Katz, who traveled to Poland with Solasz, said the people at the farm put on a feast for Solasz. “They were so loving and they just adored Sam,” she said. 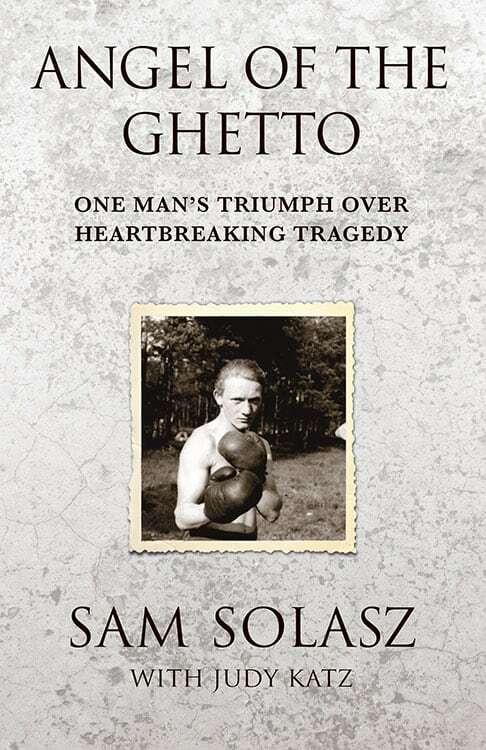 Solasz’ memoir, “Angel of the Ghetto” is divided into two parts. The first half recounts his exploits in the Bialystok Ghetto during the Holocaust, while the second half details how he came to the United States as a Holocaust survivor after World War II with only $10 to his name, and went on to create a business, Master Purveyors, which supplies meat to restaurants and hotels around the country. Solasz said writing this book was very emotional in many ways. Soalasz said that one of his goals for the book is for people who don’t believe there was a Holocaust to read it. Charles Prentiss, creator and star of Jewish Life Television’s popular national one-hour weekly television series, “Chuck Prentiss’ Jewish Broadway” praised Solasz’ book. Prentiss noted he got connected to Solasz through Rick Bruskin of Pomperdale’s Deli in Fort Lauderdale. Bruskin ‘s best friend is Solasz’ son, Scotty Solasz. There were stories in the book that his children or his wife, Rose Solasz, never heard before. “There are stories that I was amazed to hear as I never heard them before, but there are also many stories that I did hear and he’s been telling me those stories the past 61 years that I’ve been with him,” she said. Prentiss called Solasz’ memoir the best Holocaust book he has ever read. Prentiss, Rose Solasz and Katz praised him for achieving the American Dream by coming to this country as a Holocaust survivor and starting a successful business. Visit angeloftheghetto.com for more information on the book.